Why Is Your Pond Green? 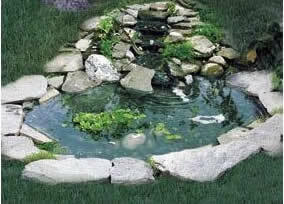 Backyard ponds provide a tranquil setting to any landscaping project, as shown in Figure 1. But, no matter how much effort you put into them sometimes they will turn green. Following are the 5 most common reasons why your backyard pond may have turned green. In a landscape setting it is not uncommon for a pond to face an unusual amount of organic matter. Leaves from trees and grass clippings in the pond are common problems that face most pond owners and if you have fish, fish excrement adds to the problem of more organic waste than the ponds natural biological filter can successfully handle. Clean out the organic matter on regular intervals. Be more cautious when mowing the lawn and trimming trees and shrubs. Remove some of the surface plants in the pond. The beneficial bacteria, that is needed to consume the organic matter develops on the surface of the pond. Increasing the surface area of the pond will increase the amount of beneficial bacteria that develops in the pond. You can add formulated beneficial bacteria specifically designed for ponds. Make sure you purchase a product that is suitable for the size and type of pond you have. If you are continually adding fresh water to the pond, due to evaporation or other water loss problems you are not allowing the pond to find an ecological balance. It can take from 20 to 45 days for a pond to establish itself. Green water, due to algae growth, a few days after a pond is installed is not an uncommon problem. Any fresh water that is added to the current pond water should be filtered to remove chlorines and other chemicals that have been put in the potable water supply to kill all of the bacteria, because you need the beneficial bacteria in the pond to keep the water clear. Note: Municipality delivered, unfiltered, potable water is not what you want your fish to be living in. The same chlorine that is designed to kill bacteria will have a detrimental effect on your fish population. If you are continually adding water you should check your filter system and any water pumps that you may have installed in the pond to ensure that you do not have any leakage. Note: When adding water, do not shock your pond with water that is a different temperature than the pond’s water. Smaller ponds are more susceptible to turning green than larger ponds because it takes very little contaminate to kill the beneficial bacteria. Any insecticides, weed killers or other chemicals used on lawns and plants in and around the pond can kill the beneficial bacteria if it enters the pond water. If your pond filtration system uses any type of UV sterilizer or water clarifier you must turn that portion of your filtration system off for 4 to 5 days after adding any beneficial bacteria as these types of sterilizers and water clarifiers will kill the beneficial bacteria. In smaller ponds you can kill the beneficial bacteria with the adhesives used to seal the PVC pond liners. If you added rocks to your pond it is important that they were thoroughly washed to ensure that they were not carrying any parasites or other contaminates that would be detrimental to the beneficial bacteria in your pond water. Make sure the pond has proper aeration. You may have too many fish or possibly the fish have grown to where the quantity and size of the fish stock is larger than the natural biological filter can deal with. It is also possible that the fish, for whatever reason are not healthy. Sick fish can contaminate the pond water as well as disrupting its natural balance. Whether the problems are too many fish, or big fish or sickly fish, you may have to cull your fish stock. Every geographic area goes through climate changes at the start of a new season. If the climate change takes place quickly and produces a rapid change in the pond’s water temperature it will have a detrimental effect on the ecological balance of the pond water. There is nothing you can do to prevent the green pond water due to climate change. It could take as long as 50 days for the pond to balance.